There&apos;s never been anything quite like the human flag. No feat of spectacular strength, bodyweight beast move, or gravity-defying display of power seems to attract a crowd like this simple horizontal hold. A strong body goes up, and even though everything you know says it should come crashing down, it simply doesn&apos;t.
Let&apos;s be clear: Achieving a hold of just a second or two is indeed a remarkable goal in its own right. But there&apos;s no reason you have to stop there! If you know me, you know I love unusual grips, exaggerated angles, and unique physical demands. 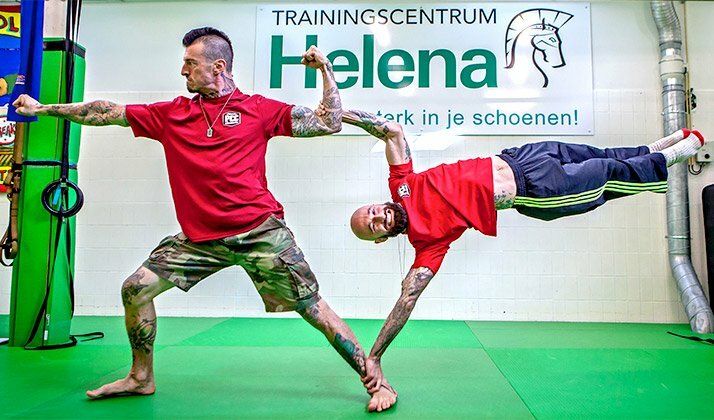 In my article, "The Craziest Move You&apos;ve Ever Seen," I took this movement to the next level of difficulty through human flag fat-bar training, one-arm variants, and the use of external resistance. Since then, I&apos;ve come up with even more new and innovative ways to step up my game. With Flag Day at hand, now is the perfect time to reveal my findings! Al Kavadlo Human Flags Everywhere! When flagging off of a tilted bar, extra recruitment of the core and lateral musculature are required to keep the proper position. This isn&apos;t limited to the abs and lower back either. Be prepared to generate an extra-hard flex from your glutes, obliques and even your quadriceps! "When flagging off of a tilted bar, extra recruitment of the core and lateral musculature are required to keep the proper position." Additionally, the emphasis on the lats and shoulders is altered when in this position, as you must apply extra pressing power from the lower extremity. So while the visual difference between the angled pole flag and the vertical flag is minor, it&apos;s far harder than it looks. Let&apos;s take it past the pole. In my last article, I discussed odd surfaces such as rock formations and subway stations. And while those objects offer a fair set of challenges, they are both completely stable, unwavering, and rooted firmly into the earth. But what happens when we remove stability from the equation? To begin with, performing a human flag on a flexible surface will rock your midsection in unprecedented ways. You will have to make nonstop micro-adjustments to every muscle in the body in order to keep yourself from bending, twisting, or dropping to the ground. The demand for full-body tension is extreme even by my standards. So what&apos;s the most accessible, flexible, vertical surface on which to flag? A wire fence, of course! This proves to be incredibly taxing to the hands and fingers, as you might expect. The grip is truly unlike anything you&apos;ve ever experienced. Be prepared to squeeze hard. It may not be the most pleasant sensation on the fingers, so take your time with this one and don&apos;t be afraid to wear gloves! "So what&apos;s the most accessible, flexible, vertical surface on which to flag? A wire fence, of course!" This particular grip not only involves an altered top-hand placement, but also an adjusted lower-hand position. When performing a traditional flag, you use your top hand to grab the pole as you would if you were grabbing a pull-up bar. This time, however, your fingers must hook over the top in a thumbless neutral grip, rather than around the pulling surface. Think you have a strong grip? Give this one a try. While the hook hand (top hand) requires extra grabbing from the fingers, the flat palm (bottom hand) eliminates any gripping at all. But that doesn&apos;t mean it&apos;s easier. The lack of grip from the bottom hand forces you to press even harder and tense your body even tighter due to the lack of foundation. In other words, when you can grab a bar with the lower hand, you initiate tension starting with the grip. When the palm is flat, you can&apos;t grab on to the object on which you are flagging. So make sure to spread your fingers wide to increase surface area. This one is a monster! "While the hook hand (top hand) requires extra grabbing from the fingers, the flat palm (bottom hand) eliminates any gripping at all. But that doesn&apos;t mean it&apos;s easier." The human flag crucifix is a unique variant in which the pole is placed against the back of the individual&apos;s neck, with both arms fully extended, running alongside the pole. In order to keep the body supported, the bottom arm must actively press against the bar to lift the body up, while the top arm must pull aggressively, as if trying to bring the bar toward the body. It&apos;s worth noting that the human flag crucifix—like most flag progressions—can be jarring to your connective tissue, not just the visible muscles. And which connective tissue might start barking first can vary depending on your particular anatomy, strengths and weaknesses, and technique. So make sure to take plenty of breaks, and back off right away if you feel excessive strain, particularly in the elbows and shoulders. "It&apos;s worth noting that the human flag crucifix—like most flag progressions—can be jarring to your connective tissue, not just the visible muscles." I spoke earlier of the intrinsic challenges of performing a flag against a flexible surface. So how about trying it on a flexing surface? While using a fence for a "pole" provides a great degree of instability, it&apos;s still a lot more rigid than another human! That&apos;s right friends: This time you&apos;re not using a pole, a structure, or any inanimate object at all. It&apos;s your training partner! At first glance, it&apos;s easy to discern that the flagger has some extra work on his hands. Obviously, no one&apos;s skin is completely taut, no matter how hard they train, so the flagger must constantly adjust his grip—and many other nuances—to the uncontrollable wavering of his partner&apos;s skin. "At first glance, it&apos;s easy to discern that the flagger has some extra work on his hands." The flagger must also be extremely conscious of where he places his hands. The lower hand must be placed close to the foot to maximize stability. If you put it too high, not only will you put yourself in a mechanically disadvantageous position, you may snap your partner&apos;s shinbone! The partner being flagged upon (the human flag pole) has an enormous task upon him as well. First of all, you&apos;ve gotta be as solid as a rock—both physically and in your mental focus—for someone to flag off of you. Secondly, be prepared to subtly lean away from the flagger as he lifts his feet off the ground and gets into position. Failure to counter the flagger&apos;s weight will result in both of you toppling over. I recommend extending your free arm to help strike a balance. And finally, in order to simulate a pole, the forearm being flagged upon should be perpendicular to the ground. Make sure you do plenty of pull-ups, because you&apos;ll need strong biceps when the flagger places his top hand against your arm. As with any partner workout, communication is key. Make no mistake: It took my brother Al and me plenty of time and practice to finally nail it. When all is said and done, I consider myself first and foremost to be a student of bodyweight physical culture. Every day, I look forward to seeing where my journey takes me, but I also want to hear about your experiences and findings! 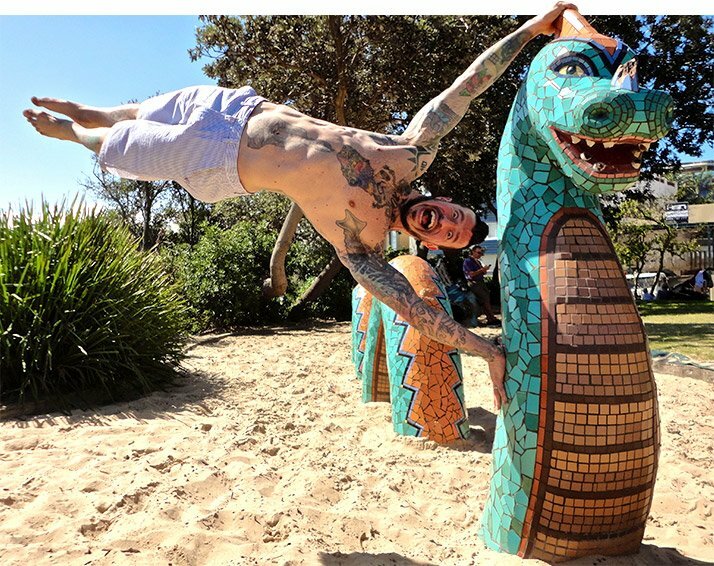 Please let me know in the comments section below if there are any versions of the human flag (or any bodyweight feat) that I left out or that you&apos;d love to see. I&apos;m always happy to learn something new, so let&apos;s keep the dream alive!